In the middle of a classroom, where the tables have been pushed to the sides and the chairs placed in a circle, sit a series of blankets. They include the traditional flags of the Haudenosaunee and Mohawk nations, but others have been prepared by school children. As the participants arrive, they are greeted by the facilitators – Dawn Maracle and Zoë Aarden – who over the next two hours will lead the group through an exercise that reveals the history of Indigenous Peoples in Canada. Known as the KAIROS Blanket Exercise, the program is an interactive way to convey truth, understanding, respect and reconciliation among Indigenous and non-Indigenous people. Over the course of the exercise, participants watch as the land they stand on shrinks, see how illness and government policies reduce your populations and hear testimonies from those impacted. On this particular day, the participants are senior leaders in the University of Toronto's Faculty of Medicine, including department chairs, administrative leaders and members of the dean's executive team. However, the blanket exercise is being used frequently throughout the Faculty of Medicine as a way to not only convey the poorly understood history of Indigenous nations within Canada, but also the intergenerational trauma that has been caused by colonialism. This includes the claiming of traditional Indigenous lands by settlers as well as the impacts of residential schools and the Sixties Scoop. “It’s important for us to understand the history and trauma of Indigenous Peoples in Canada, not only in light of our commitment to the Truth and Reconciliation Commission recommendations, but as health professionals who work with Indigenous populations,” says Professor Trevor Young, dean of the Faculty of Medicine and vice-provost, relations with health care institutions. Dr. Lisa Richardson, co-lead of Indigenous Medical Education in the MD Program, says that blanket exercise is an important educational tool that helps individuals draw an emotional connection to the lessons they learn. 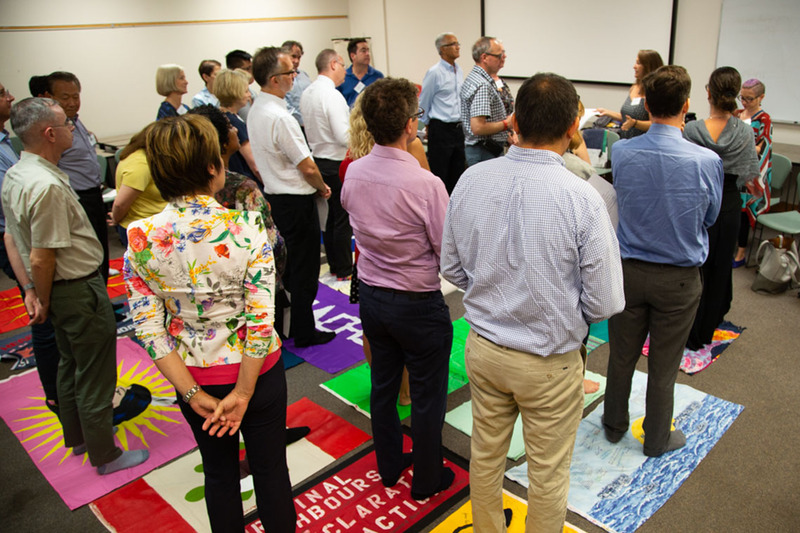 Dr. Lindsay Herzog, a family medicine resident based at Mount Sinai Hospital, has used the blanket exercise to help other residents understand the historical context for Indigenous health issues. She discovered the exercise in the final months of medical school while taking an elective course in urban Indigenous health. The course encouraged engagement with Toronto’s urban Indigenous population through a variety of community events, one of which was participation in the blanket exercise at U of T's First Nations House. But, it’s not just health-care professionals who would benefit from participating in the blanket exercise.